The implant calculator is used to determine either the duration of an implant for a given implant date and seed strength, or the seed strength required for a given implant date and duration. 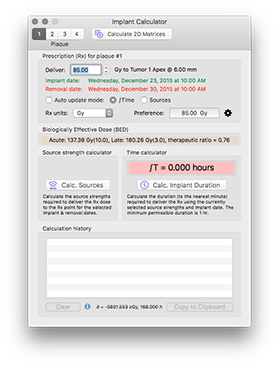 The δ parameter indicates how closely the solution approximates the desired target dose for the indicated duration. Auto update: For advanced users, when enabled, you can run a sequence of calculations for different prescription doses by entering the initial Rx dose in the Deliver field and then using the bumper arrows to change the dose by increments of 1 Gy. The required time or source strengths (according to the selected auto update mode) will be calculated and saved to the history listing from where it can be copied to the clipboard. 1. In the Plaque window, load the plaque with sources normalized to 1.0 at the time of implant. For example, most of the sources might be 1 mCi, but a few might be 0.5, 2.0 mCi and so on. The source strength solution will maintain the initial relative distribution of normalized strengths. Enter the prescription dose (e.g. 85) in the selected units (e.g. Gy) and the prescription point (e.g. the tumor apex). Enter the date and time of plaque insertion. Enter either the duration in hours (e.g. 168) or the date and time of plaque removal. 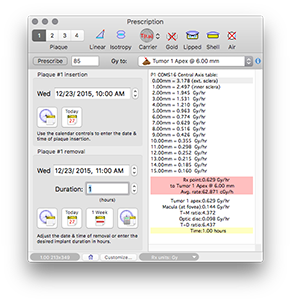 Note that the Rx point background color is red indicating that the prescription has NOT yet been achieved. Click the Implant Calculator button, or select Implant Calculator... from the Plan menu to open the Implant Calculator window. Observe that the prescription has not been fulfilled, the background color of the time field is red. Click the Calc. Sources button in the Source calculator section. The activities per seed, calibrated to the implant date and maintaining the original distribution of relative strengths, that are required to deliver the prescription will be calculated and the associated inventory item(s) will be updated. The background color of the time field changes to green. The Biologically Effective Dose (BED) and therapeutic ratio for the implant schedule of the currently selected plaque are calculated and displayed for the prescribed absolute target dose (e.g. 85 Gy). The linear quadratic model α/β and other parameters for acute and late effects may be customized in the BED calculations section of the Model pane of the Preferences window. The BED actually delivered at the Rx point is displayed in the treatment plan document. 5. The plaque will update with the new source strengths. 6. The prescription window will update, note that the Rx point background color changes from red to green indicating that the prescription has been achieved. 1. 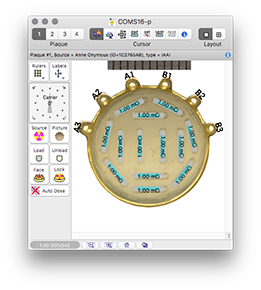 In the Plaque window, load the plaque with sources of fixed strength and calibration date (e.g. 3.5 mCi on the date of implant). Optionally set the duration in hours to 1.0. Click the Calc. Implant Duration button in the Time calculator section. The duration (in hours) that is required to deliver the prescription using the current plaque loading will appear in the green highlighted solution area (e.g. 139.8 hours). Note that the Biologically Effective Dose (BED) for a 140 hour implant is greater and the therapeutic ratio is lower compared to a 168 hour implant . 4. The prescription window will update, note that the Rx point background color changes from red to green indicating that the prescription has been achieved.